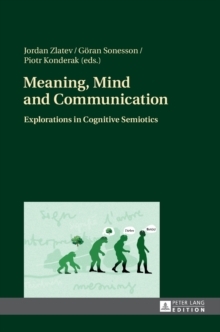 This volume constitutes the first anthology of texts in cognitive semiotics - the new transdisciplinary study of meaning, mind and communication that combines concepts and methods from semiotics, cognitive science and linguistics - from a multitude of established and younger scholars. The chapters deal with the interaction between language and other semiotic resources, the role of consciousness and concepts, the nature of metaphor, the specificity of human evolution and development, the relation between cognitive semiotics and related fields, and other central topics. They are grouped in four sections: (i) Meta-theoretical perspectives, (ii) Semiotic development and evolution, (iii) Meaning across media, modes and modalities, (iv) Language, blends and metaphors.